For many young families, decorating for Christmas is a time for creating traditions. Little ones help hang ornaments on the tree. 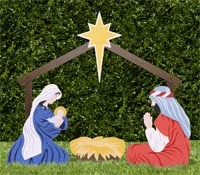 The oldest child may have the honor of placing the angel or the star on the highest branch. 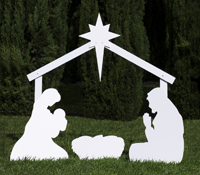 Each person in the family may take a role in setting up the nativity set on the mantel or the piano. Perhaps you and your children have collected nutcrackers over years of attending the Nutcracker Ballet together. Maybe you have a treasured ornament or snow globe collection, with each one representing a family vacation. You make a ceremony of Christmas decorating from the hauling of the boxes from the attic or basement, to the special music you play, to the hot chocolate you drink. 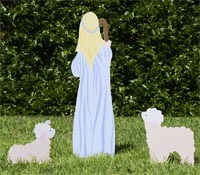 You might read Christmas nativity books with the kids. Christmas decorating can be a time of love and laughter. But what happens when those children grow up and have homes of their own? Whether this is your first season without your children at home or your fifth, empty nest syndrome can kick in with a vengeance at holiday time. Defined by Psychology Today magazine as “feelings of depression, sadness, and, or, grief experienced by parents and caregivers after children come of age and leave their childhood homes” empty nest syndrome can occur when kids go off to college or move away from the home you have shared together. Even though you are pleased and proud of your adult kids and what they are accomplishing, you still feel twinges of longing for the past. When that past included tender December moments reading Christmas storybooks, singing carols and unwrapping the treasured family creche, those twinges can intensify. They may even threaten to spoil your joy for the season. If your home promises to be an empty – or almost empty – nest for the holidays, it is time for a mental shift. You can start some new traditions this year, and they may bring you renewed joy in ways you did not expect. Here are seven holiday suggestions for empty nesters. Embrace simplicity. Yes, it was fun to watch the kids’ faces as you lugged all the boxes into the living room, but it wasn’t so much fun to pack it all up again after New Year’s, was it? Now that the kids are out of the house, you have the opportunity to choose your favorite items to place on display. Instead of all the cartoon characters and souvenirs, like Peanuts decorations, for instance, you can go with a more subtle and elegant approach. You might try a smaller tree this year or a less opulent outdoor light display. Give back. If your kids will be home for Christmas Day, but not for Christmas Eve or vice versa, think about ways you can volunteer in your community. Hospitals, homeless shelters and soup kitchens all utilize volunteers to help make Christmas bright for the people they serve. You’ll feel better, and the time will fly by when you help others. Get out of town. If your grown children are spending Christmas with the in-laws, it can be the perfect time for you to plan a little get-away. It can be as simple as a weekend overnight in a downtown hotel or as exciting as a week at a beachfront resort. If home is where you want to be for December 25th, the thought of a New Year’s vacation might help boost your spirits. Be flexible. You will win points with your kids and their significant others if you are open to less than traditional celebrations. Yes, your family may have always opened gifts on Christmas Eve, but it doesn’t have to stay that way, does it? If your kids can be home for New Year’s Day, make that your Christmas celebration. Or celebrate Christmas early this year on a date or weekend that is convenient for everyone. It is the love you share that it important, not the specific date. Have a party. Have you down-sized to a new home but you still don’t really know your neighbors? A holiday open house can be a great way to make new friends and to get your mind off the Ghost of Christmas Past. If you like going all out as a hostess, you can bake and cook to your heart’s content. Or, you can keep with the simple theme by asking people to bring a simple dish or dessert to share. Accept invitations and offers of help. Your kids will want – and need – to start their own traditions, but they can’t if you insist on continuing yours. Relax and enjoy a meal that your son and daughter-in-law create at their house. Play with the grandkids and enjoy being a guest for a change. When a holiday meal is at your house, ask your kids (and grandkids) to help with the preparation of meal. Enjoy quiet times of reflection. This is a season of change. Your kids do not need you in the same ways as they used to, but that doesn’t mean they don’t need you. Look for times to talk quietly with your adult kids about their Christmas memories and let them share about the new ones they hope to make. Also, find time for solitude this holiday season. As you place Baby Jesus in the crib this year, reflect on the joy of Christmas – both past and present. You may have an emptier nest than you would like, but you can always celebrate having a full heart. Posted in Christmas, Guides on September 24, 2017 and tagged church, creches. Older →Were Animals in the Manger on the First Christmas?